Dr. Vidic: What if I told you the human body not only housed the individual’s memory, but the memory of his ancestors as well? Genetic memory, if you will. Migration, hibernation, reproduction. How do animals know when and where to go, what to do? Desmond: That’s just animal instinct. Dr. Vidic: Now you’re arguing semantics, Mr. Miles. What ever you call it, the fact remains: these creatures hold knowledge absent the requisite first-hand experience… our DNA functions as an archive. It contains not only genetic instructions passed down from previous generations, but memories as well; the memories of our ancestors. So begins one of the most curious video game series of the last ten years. The premise of genetic memory is rather silly but it is such a fascinating idea and finely executed that you don’t really care as you wonder at the mere prospect of looking into your own past. This first game begins with the abduction of one Desmond Miles by the multinational corporation known as Abstergo. The company has developed a device called Animus in which we can view the memories of our ancestors. Desmond Miles has some information that Abstergo want. 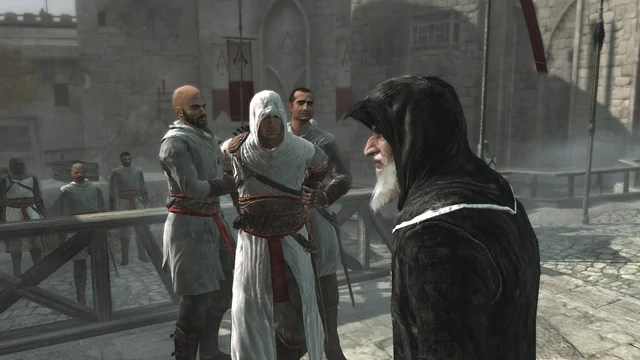 They force him to travel into the memories of an ancestor of his named Altaïr Ibn-La’Ahad who lived during the Crusades. It seems there is a secret war between two organisations: The Assassins and The Templar Knights. Both groups existed in real life, but in this series they are quite different from reality. Altaïr was a Master Assassin but reckless, and after a botched mission is busted back to apprentice. Under the direction of mentor Al Mualim, you must kill a succession of people it is said are stoking the flame to keep the Crusades going. It turns out that Al Mualim was actually a Templar who’d infiltrated the Assassins in order to seize something known as “The Piece of Eden” and those people were trying to end the wars. After killing Al Mualim, the Piece shows Altaïr a map of the world where other Pieces are located – including the new world which has yet to be discovered. One of the team who abducted Desmond (named Lucy) is an Assassin and at the end she helps Desmond escape. Abstergo, unsurprisingly, are a front for The Templars. Lucy and Desmond retreat to a warehouse where they meet two more Assassins: the sharp-tongued Brit Shaun (a historian) and the cool and funky techie named Rebecca. With a new animus, Desmond must explore the memories of Ezio Auditore Da Firenze who lived in Renaissance Italy. Ezio is born to a long line of Assassins – something he knows nothing about… until his family is killed (except his mother and sister). Against the backdrop of the rise of the Borgias (and in particular the Papacy of Rodrigo Borgia who in this universe was a Templar and responsible for Ezio’s family’s murder), Ezio must unveil why his family was killed all the while learning about the Apple (Piece of Eden) that Altaïr found. The Papal Staff is also a Piece of Eden and after seizing it from Rodrigo, Ezio is confronted with a hologram of an ethereal woman – calling herself Minerva – who explains about a precursor race destroyed by a great disaster. This game introduces many elements only hinted at in the first: practically every conspiracy theory in our world is true… and it is ultimately linked to the ongoing millenias-old war between the Assassins and the Templars. Biblical mythology and ancient alien theory are integrated here along with every fringe archaeological theory. In the real world, after they were discovered in the warehouse, the group have fled to Ezio’s villa at Monteriggioni. 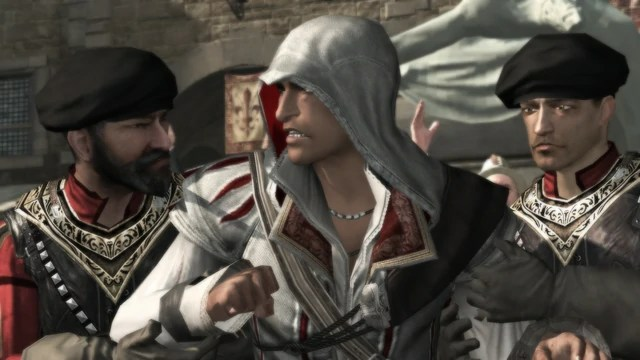 Desmond must once again enter then Animus to explore Ezio’s memories – the Assassins are desperate to find the Apple; it wasn’t under Vatican City, much to their frustration. 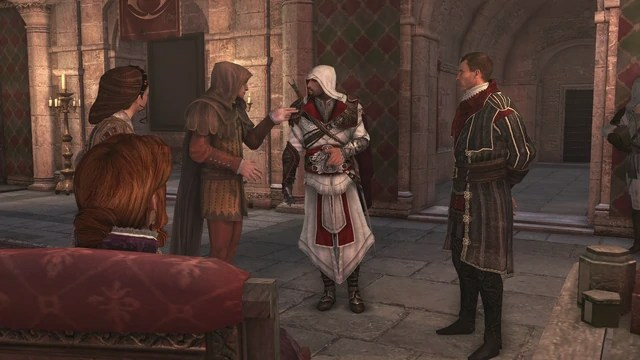 Ezio is now in Rome and seeks to forge a new coven of Assassins in a city ruled by the Templars. He is convinced that the Apple is in the city and he, Rodrigo Borgia and his son Cesare are looking for it. After a final showdown with Cesare, Ezio hides the Apple beneath the Colosseum. The team up sticks and head there. They find the Apple but another hologram – this one calling herself Juno – takes control of Desmond’s body and kills Lucy. Desmond tries to fight her off, tries to tell Lucy to get out of the way but Juno explains that Lucy must die because she has defected to the Templars. Desmond falls into a coma, leaving a shocking cliffhanger. To save his life, Desmond is placed into The Black Room, a kind of sandbox area for people suffering possible brain damage due to using the Animus; he is secretly flown home to the USA. He is not alone in The Black Room either. A previous descendant uploaded himself into the software; this person also left lots of clues for Desmond in the previous games that opened up some fascinating side missions. He explains that Desmond must complete the memories of both Altaïr and Ezio in order to wake up. 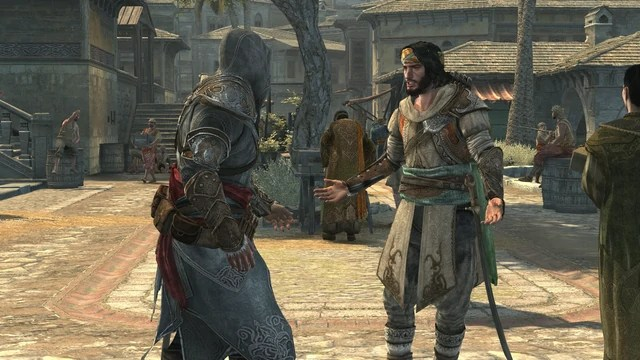 Ezio is a much older man, first travelling to Masyaf to find Altaïr’s Library, and then on to Constantinople (recently fallen into Ottoman hands) to find the keys to open it. While there he uncovers another Templar plot. The two sons of the Sultan – Selim and Ahmet – are at loggerheads… but is one of them a Templar? Of course he is! You also get to go back to Altaïr and follow his reconstruction of the Assassin’s following Al Mualim’s betrayal, a power struggle, and find out what is in the Library. It is a fitting end, we see Altaïr dead and Ezio himself is an old man. At the end, Desmond comes out of his coma with a comment “I know where we have to go next”. Jupiter has told him that a massive solar flare destroyed their race, there exists on Earth the tools to stop the next one… which is due on 21st December 2012. The team (along with Desmond’s father) use the Apple to open a cave somewhere in New York State where there is an enormous complex from the precursor race which they call “The Temple”. However, he hasn’t fully recovered and slips into a coma again. The team put him into an Animus where he wakes up in the memory of Haytham Kenway, a British man who – following an assassination in a theatre in London – travels to Boston in the colony of Massachusetts. 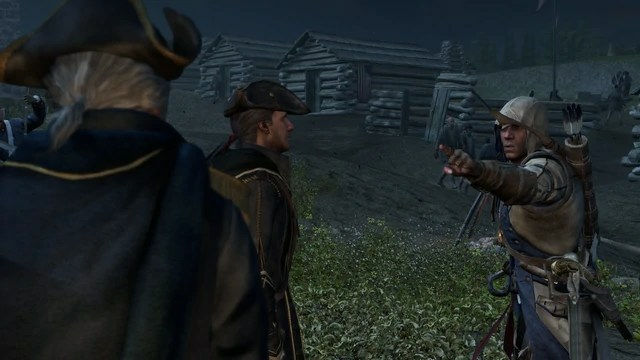 We play as Haytham for some hours before it is revealed that he is a Templar working on behalf of the British government. His mission is to find the Temple and to enlist the help of the Mohawks to find it. After a while, we end up in the memory of Ratonhnhaké:ton the half-mohawk son of Haytham. 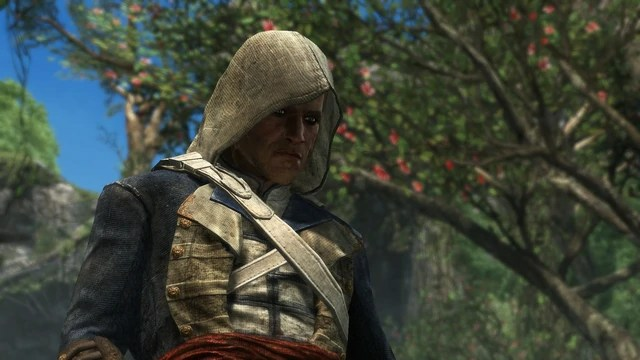 Renaming himself Connor Kenway, he works his way through the American Revolution, seeking his father and plotting his revenge against those who attacked his village. Though you fight mostly on the side of the Patriots, he doesn’t trust the former colonists especially when it means his people are to be relocated. Ultimately, it is his father and Charles Lee that are his targets. Desmond wakes up – it turns out that the temple they are in is the tool that will protect Earth against the solar flare but he must find several power sources and the key to open the inner sanctuary. Desmond is a direct bloodline of the alien race and only he can operate it… but the process kills him. At the end, it turns out that the entirety of Desmond’s memories have been downloaded into the cloud. Advances in Animus technology, and samples of Desmond’s DNA, have allowed Abstergo/Templars to access anybody’s memory on any computer with the relevant software. Desmond is dead and you play somebody recently employed by Abstergo Entertainment (the video game wing of the parent company) to look through the memories of Edward Kenway – father of Haytham and grandfather of Connor. However, the real mission is to find another ancient site called “The Observatory”. Kenway travels to the Caribbean but soon finds himself in the middle of the war after killing an Assassin who was defecting to the Templars. Both factions are searching for The Observatory and one man knows where it is – they call him The Sage. In the real world, a mysterious voice asks you to hack computers and pass the information to a courier. Now, who didn’t punch the air in delight to see it was Rebecca from the previous games, with Shaun posing as a coffee vendor? It later transpires that the man asking you to do all the hacking is in fact The Sage (but Kenway killed him so who is he?) No explanation is given for this but with you off the hook and The Sage believed responsible for the hacks, you are free to carry one conspiring with the Assassins. I am going to leave it here because this is already 1700 words. In part 2, I’ll look at what elements of the story has kept me gripped. You’ll notice if you watch the video at the top, that there are three extra trailers. the first is for AC: Liberation , the second is AC: Freedom Cry; both are DLC for AC4 which I have not played. The last one is AC: Unity, which is the next in the series and released in November.